The Golden State Warriors trailed the Oklahoma City Thunder, 48-42, at the end of the first half of Game 7 of the Western Conference Finals. Then Sen. Bernie Sanders (I-VT) arrived. The Warriors rallied in the third quarter behind revived three-point shooting and came back to defeat the Thunder soundly, 96-88. And some Warriors fans are crediting Sanders for the win. 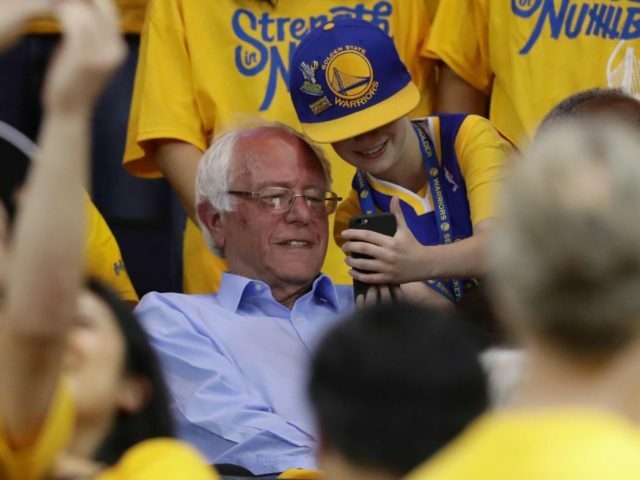 Maybe Bernie Sanders is exactly what the Golden State Warriors needed. Sanders arrived at halftime to watch Game 7 of the Western Conference finals in Oakland, Calif. The Oklahoma City Thunder were up, 48-42 over the Warriors. The winning team would face the Cleveland Cavaliers in the NBA Finals. The losing team would go home. With Sanders watching, the Warriors outscored the Thunder by 17 points in the third quarter on their way to a 96-88 win, setting up a rematch for the title with the Cavaliers. The Warriors will play the Cleveland Cavaliers in the NBA Finals. Coincidentally, Cleveland is also hosting the Republican National Convention in July.